The Human Development Report Office (HDRO) convened two important statistical meetings this past week to discuss human development indices and indicators. Both meetings come at a crucial time as HDRO embarks on a major effort to re-articulate the concept of human development in the current global context. During the meeting participants addressed many aspects of the statistical production, tackling both the technical elements, as well as communication with data producers and users of human development statistics. The discussion covered the computation of composite indices and other human development indicators, approaches to dealing with missing data, the analysis and visualization of data for the Report, as well as for the on-line presentation and database. Issues related to communication with NSOs and the international statistical community were discussed too. The members of the panel also advised on the use of new data sources, in particular the use of Big Data, to complement or supplement official data for better measuring and understanding of well-being, poverty, inequality and other relevant aspects of human development. When looking ahead, the discussion focused on possible methodological updates for 2020. Panel members stressed the importance of introducing a new composite index on the environmental sustainability of human development, respecting the human development conceptual framework and contained within the Sustainable Development Goals (SDGs) measurement framework. During the United Nation’s 50th Session of the Statistical Commission, HDRO also held a side event entitled Statistics of Human Development: A Conversation with National Statisticians. The purpose of this meeting was to inform NSOs about HDRO’s statistical work, explain how we use the data that NSOs produce and inform them about the Office’s work plan for the year. Almost 40 people attended the meeting, including representatives from NSOs in Egypt, Indonesia, Mongolia, Morocco, Senegal, Tunisia, Tanzania, Palestine, and the UAE; Regional Statistical Offices including the Arab Institute for Training and Research in Statistics, the European Free Trade Association Statistical Office, and the Statistical Centre for the Cooperation Council for the Arab Countries of the Gulf, as well as representatives from the UN including the UN Statistics Division, UN Women and UNICEF, and partners in academia from the Oxford Poverty and Human Development Initiative. Among other things, the event highlighted the synergies between the human development approach and the SDGs. They are both universal, people-centered, multidimensional, track progress and measure achievements, promote the use of disaggregated data (by gender, location, income, etc.) and eradicating poverty is at the core of both. Moreover, most human development indicators (over 140) are also the same indicators used for monitoring the SDGs, which again highlights the commonalities between the two. With 25 global HDRs, 40 Regional HDRs and over 720 National HDRs, human development reporting provides complementary aspects to the 2030 Agenda: it is a holistic approach to development; it includes a variety of analyses including qualitative, causal, and life-course; it assesses distributions and inequalities by using analytical tools such as composite indices, dashboards and tables; and it is open and flexible towards new and emerging issues. 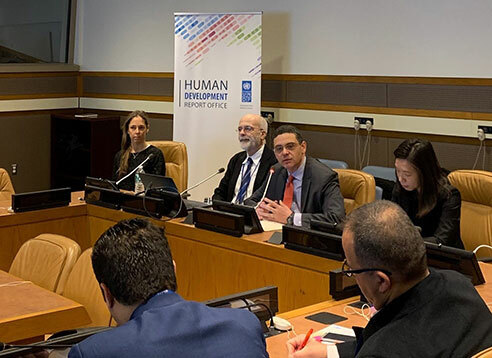 The event also introduced inequality as the theme of the 2019 Human Development report, provided an overview HDR statistical framework and of the consultation process, and concluded with a discussion of updates to the methodology.